In collaboration with the Congolese mining cadastre (CAMI), mining service SAESSCAM and representatives from local civil society organisations, IPIS organised a series of field visits to monitor artisanal mining activities and the involvement of armed groups and criminal networks in mineral exploitation and trade. This resulted in the publication of an interactive web map providing information on e.g. the on-site presence of armed groups and criminal elements within the Congolese army (FARDC) and their activities, as well as indicators of the relative importance of the mining site. 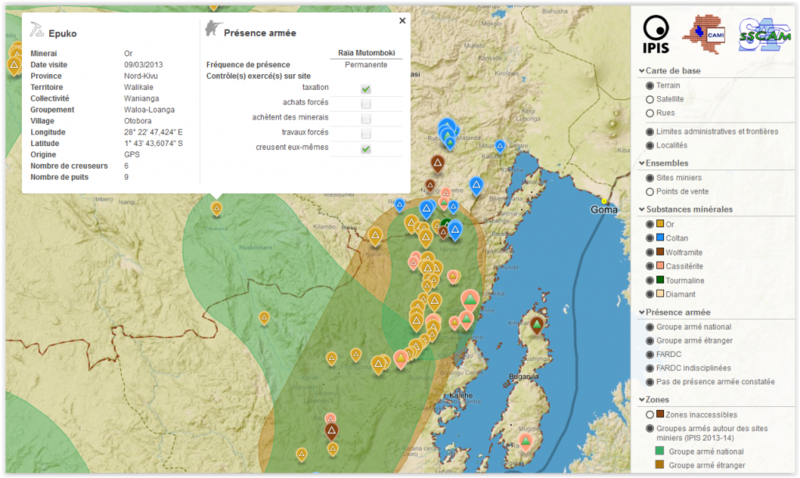 It shows the location of 150 trading centres and nearly 1100 mining sites in Eastern DRC. This report provides an analysis of the data collected by the local teams between March 2013 and March 2014 as presented by IPIS on its web map. It analyses the most striking findings, focussing on developments surrounding security and how they have impacted on Eastern DRC’s artisanal mining sector. Finally, the report also explains how the map can be used to assess risks in mineral supply chains.